Two Wheels Good is a long established "traditional" cycle in Stoke Newington, London. For years they had a rickety old website which bearly stood up under the load of their frequent site visitors. 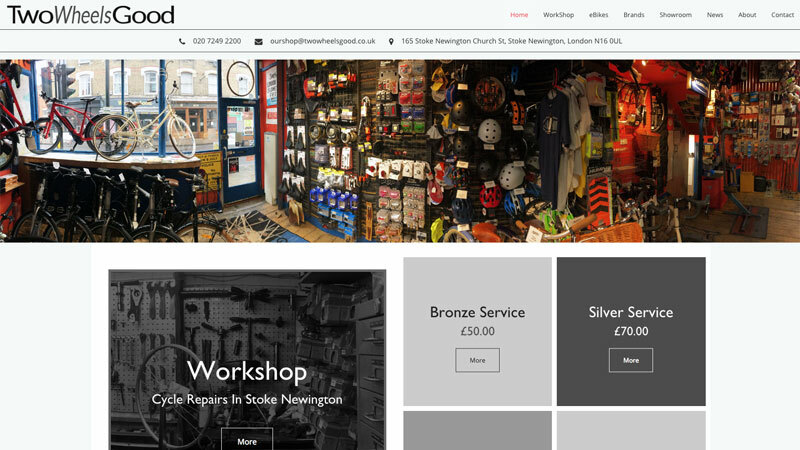 In March 2018 they approached us to revamp their online offering, bringing it up to date in terms of content and technology, while retaining an "old skool" feel. The shop logo, which we faithfully reproduced for the website, was created many years ago in Quark on an early Macintosh computer. This set the tone for our re-designed: We wanted the site to look like an early Mac operating system, with clean fonts, lots of white space and no fancy elements. We wanted the site to feel like it had been built up over the years, not an entirely fresh re-design, so we purposefully made sections that sat next to each other on the page appear different in design but all work collectively as a whole. Both we and the client were over the moon with the end result: The site feels old and somewhat traditional but is bang unto date in terms of technology and design techniques. Following the deployment of the site we were engaged to maintain it on an on-going management contract. UPDATE JAN'19: At the clients request the site was updated and expanded to include an online store, for which we used our popular CMS Store add-on.